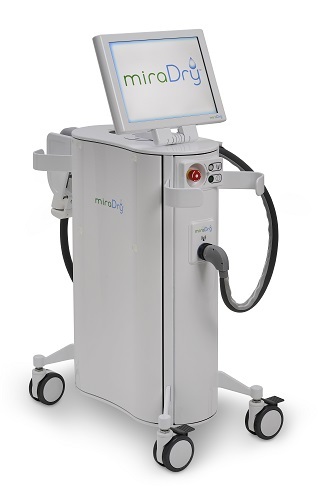 miraDry is the first and only device cleared by the U.S. FDA for the treatment of excessive underarm sweating or axillary hyperhidrosis. Hyperhidrosis is a medical condition whereby a person has abnormally increased or excessive perspiration or sweating most commonly on the hands, feet, armpits (axillae) and groin area. According to the Hyperhidrosis Support Group, approximately half a million people in the UK are affected by the condition. 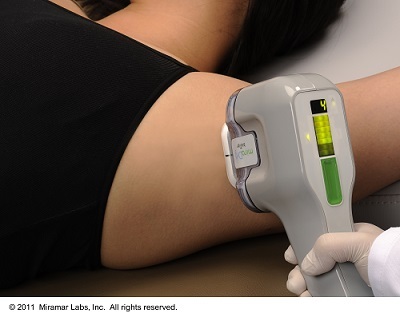 The device delivers precisely controlled electromagnetic energy to the armpit which heats the sweat glands and destroys them. This results in an immediate and dramatic reduction in underarm sweating. Sweat glands do not grow back, so the treatment is long-lasting. In a clinical study, patients experienced an average of 82% reduction in underarm sweat after two treatments. Treatment prices start from approx €1,700 for a single session. Two treatments are generally required, however, some people find that one treatment provides an adequate reduction in sweat. The energy heats the sweat glands, causing cellular thermolysis which destroys them. This results in an immediate and dramatic reduction in underarm sweat. Sweat glands do not grow back, so the treatment is long-lasting. The practitioner may also do some tests to establish the extent of your hyperhidrosis, such as a starch-iodine test, which shows up the levels of sweating. This type of test is not always needed. Two treatments spaced at least three months apart are generally recommended, however, some patients may find that one treatment provides an adequate reduction in sweat. What are the risks and potential complications of a miraDry treatment? It is worth noting that the concept of compensatory sweating, whereby sweating is increased in other or larger areas of the body post-treatment, as can be a common side effect with surgical options to treat hyperhidrosis, is extremely rare in the case of electromagnetic treatment for the condition. You may also be prescribed an antibiotic cream to apply to the area, in order to reduce the risk of any post-treatment infection; however, not everyone will require this. Treatment prices start from approximately €1,700 for a single session. Two treatments are sometimes required (for a total cost of around €2.500); however, some patients may find that one treatment provides an adequate reduction in sweat.